Britain’s leading Jewish institutions are facing their worst crisis in living memory as their loyalty to the United Kingdom and support for basic universal principles of human rights and common decency come under growing scrutiny. In recent weeks Redress Information & Analysis has has been approached by a number of existing and former employees and volunteers of prominent Jewish bodies, all pointing to an acute internal crisis within their institutions. The first to make contact with us were two whistleblowers from the Board of Deputies of British Jews. They explained to us the nature and scope of the crisis gripping Britain’s top Jewish institutions and offered to put us in contact with people in the Office of the Chief Rabbi and the Jewish Chronicle newspaper. We took up the offer. Naturally, we were curious as to why our interlocutors chose or were willing to talk to Redress Information & Analysis rather than voice their concerns to a national media outlet such as the Guardian, the Independent or the BBC. All said that they were worried that their names would be leaked back to their institutions or published in the press and that, as a result, they would be sacked or ostracized by their Jewish relatives and friends. Some feared the possibility of “moles” in the national media, or people in these media who have “special relations” with the Jewish institutions, doing the leaking. We have gone to extraordinary lengths to corroborate the identity of our contacts and can confirm that they are all genuine – that they are who they said they are and that they work, or have worked, for the institutions they said they worked for. Our contacts agreed for us to publish their concerns and to quote them but strictly on condition of anonymity. Consequently, we have undertaken not to publish their names, gender or the dates on which we made contact with them, although, to emphasize once again, their identity and the Jewish institutions for which they currently work or have recently worked have been verified beyond any doubt. Our Jewish contacts expressed common concerns, focusing on questions about their identity and loyalty to Britain – the country of their birth – and on the attitude of their institutions towards the State of Israel, especially in the wake of the Israeli onslaught on the Gaza Strip in 2008-09, in which Israel killed 1,400 Palestinians, injured more than 5,000 and wreaked carnage and destruction on the 1.5 million inhabitants of the Strip. Our support for Israel, especially its attack on Gaza in 2008-09, is creating ruptures in the wider Jewish community in Britain and placing institutions such as ours under unbearable pressure. The fact that the Board of Deputies’ support for Israel is couched in relatively anodyne terms and in a superficially impartial context no longer works. The wider Jewish community, and the general public at large, are beginning to see through this. For the first time in my memory, we are being pressed by British Jews to answer questions that have always been in the backs of our minds but which we can no longer brush aside. Are we British or are we Israelis? If we are British, then is it not incumbent upon us to question, as the wider British public is questioning, the policies and behaviour of the State of Israel without harbouring any feelings of disloyalty – because our loyalty is to the UK and not to Israel? Israel purports to speak on behalf of us as Jews. Many in our community are telling us that we therefore have a special responsibility – more so than Britons of other faiths or those of no faith – to condemn Israel’s violations of human rights and common decency when dealing with the Palestinians. Many others are saying that we should say explicitly and unequivocally – both as individuals and through our community institutions – that our loyalty is to Britain first, second, third and fourth ad infinitum, that we have no special loyalty or allegiance to Israel and that, for us, Israel is just another country, like France, Italy or Spain. They say that we should distance ourselves from Israel and be the first to condemn its policies and actions towards the Palestinian people. A small but growing minority – a minority that is growing exponentially, I hasten to add – tell us that we should go further and take the lead in calling for the boycott of Israel until it implements all United Nations resolutions, including Security Council Resolution 242 of 1967, and until it begins to behave as a civilized and responsible member of the international community. But I would say that the question of our allegiance is the one that is the most serious and damaging in the long term. It does not help in this regard when some of our Jewish ministers, such as the foreign secretary, David Miliband, and the Foreign Office minister, Ivan Lewis, are either openly pro-Israel or are seen to be supporters of Israel. This casts doubt on the loyalty of all of us to Britain, our country. The Office of the Chief Rabbi, the Board of Deputies, the Jewish Chronicle and many other Jewish organizations up and down the country – at universities, for instance – are living in a time warp, as if today were 1948 or the eve of the 1967 war. The world has changed, and the information the community has available to it shows that we Jews are not in peril – on the contrary, Jews in the UK and throughout Europe are prospering like never before. 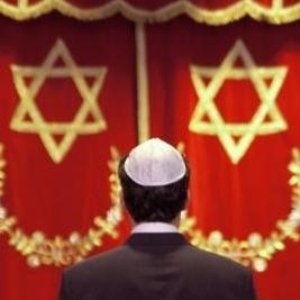 Anti-Semitism – by which I mean racist, anti-Jewish feeling – has all but vanished. In fact, it is the Muslims, not the Jews, who are bearing the brunt of racism in Europe. Islamophobia, spurred on by neo-Nazi parties and neo-conservatives, is what we Jews, as members of a wider multi-cultural community, should be fighting against. In fact, I would say that thanks to an abundance of reliable information now available on the internet, even those who live in a time warp are living a fiction in a time warp built on myths. Israel was never in danger from its impotent but bombastic neighbours: we saw this in 1956, when it invaded Egypt together with Britain and France, and we saw it again in 1967, which we now know was being planned for by Israeli leaders ever since the 1956 fiasco. Yet, our community leaders, including – I am sorry to say – the Office of the Chief Rabbi, would never publicly acknowledge this. I have no idea what they think or believe in private, in their own conscience, between themselves and God, but I cannot imagine any intelligent, well-educated and open-minded person not recognizing matters as they are. And if they are conscious of reality but act differently, what does that make them? I think I’ll leave you to answer that question. It pains me to say this but our self-appointed leaders, including the Chief Rabbi, have built our community institutions on foundations that are more appropriate to 1930s Germany than the Europe of the 21st century. You cannot have healthy institutions based on a make-believe world of fear and distrust of everyone and everything that is not Jewish. If we Jews are to have Jewish institutions per se, then these institutions should have as their primary objectives community cohesion, including full integration into our wider society, British society. We cannot – and should not want to – live in a ghetto. Our focus should be on our own country, the UK, not on promoting, speaking on behalf of, answering or apologizing for Israel. As far as Israel is concerned, our approach should be no different than that of any other British organization, be it Amnesty International, a trade union or a professional association. In other words, we should condemn it when it is in the wrong and we should praise it when it does the right thing. In other words, our approach should be based entirely on merit. Unfortunately, I see no signs of this happening any time soon. Our whistleblower at the Jewish Chronicle gave a damning assessment of the internal crisis engulfing the UK’s Jewish institutions, as reflected in the Chronicle, Britain’s top Zionist newspaper and Israeli mouthpiece. According to the whistleblower, the newspaper is “in denial” and “sticking its head in the sand” in response to the changes in UK public opinion, especially following Israel’s onslaught on Gaza. Echoing some of the views expressed by our source at the Office of the Chief Rabbi, our contact at the Jewish Chronicle said that, instead of acknowledging the changing reality around it and adapting accordingly, the paper’s management has “gone in the opposite direction and is “engaging in subterfuge”. However, our contact says, this “isn’t washing and it won’t wash”. According to our whistleblower, the Jewish Chronicle is making a conscious effort to brand itself as a moderate newspaper that is focused on the affairs of Britain’s 280,000 Jews and in tune with mainstream British public opinion. However, our whistleblower says, in reality it is “embracing the neo-conservative agenda on the Palestinian-Israeli conflict, lock, stock and barrel”, and its primary concern is “to be on-message with Israeli foreign policy, whatever Israeli government is in power – Likud, Kadima, Labour or some abominable ultra-far-right party”. Our whistleblower was especially scathing about the Jewish Chronicle’s editor, Stephen Pollard, describing him as “uncharismatic, myopic and an inarticulate and clumsy spokesman” who has “bought a one-way ticket to a parallel universe”. The whistleblower said that Mr Pollard “is so detached from reality and so out of touch with British public opinion that the notion that anyone with just an average intelligence might see right through what he’s doing could not even cross his mind”. According to our whistleblower, the idea of breaking with tradition and recruiting Martin Bright in September 2009 as the Jewish Chronicle’s first-ever non-Jewish chief political editor was Mr Pollard’s “master-plan for creating an image of the Jewish Chronicle as a mainstream newspaper and to boost its circulation, which currently stands at just over 30,400 for the UK and the Republic of Ireland – slightly more than your average local newspaper rag”. Shortly after his appointment Mr Bright told the Independent: "The idea is to broaden the scope of their [the Jewish Chronicle’s] political coverage. It would be fair to say that they want to move the political coverage away from the more parochial approach they have had in the past and rather than saying 'What will interest our Jewish readers?' they are saying that what interests readers will be what interests anyone in politics." But, our whistleblower says, Mr Pollard “picked the wrong goy” [gentile] because “not only is Martin Bright a media has-been, but he’s also a card carrying neo-conservative with strident views against Muslims and a strong affinity to Israel and, therefore, would carry little credibility with the wider newspaper-reading public”. Martin Bright’s career has followed a trajectory that has taken him from the national to the fringe media. After a steady rise between 1993 and 2005, which saw him move from a minor BBC magazine to the Guardian (national, circulation: 430,000), the Observer (national, circulation: 500,000) and the New Statesman (national, circulation: 30,000), where he was appointed political editor, in 2009 Mr Bright left the magazine under a cloud, amid speculation that his strong support for Israel, especially after the slaughter in Gaza, was too much for it to stomach. His career prospects then took a dive when, in September 2009, he joined the Jewish Chronicle (fringe, circulation: 30,400) as chief political editor. A self-proclaimed leftist, Mr Bright subscribes to a broadly neo-conservative agenda on Islam and the "war on terror", and believes that opposition to Israeli policies and actions “on the left was only explicable as anti-Semitism”. He is the author of a pamphlet for the right-wing think-tank Policy Exchange in which he attacked UK government dialogue with Muslims, a pamphlet that was warmly praised by the leading US neo-conservative Richard Perle. His friends include Observer columnist Nick Cohen who infamously declared after meeting Iraq war architect Paul Wolfowitz for drinks at the Mayfair nightclub Annabel's: "I was in the presence of a politician committed to extending human freedom." Since his appointment at the Jewish Chronicle, Mr Bright has begun writing for the website of the right-wing Spectator. As a strategy for extending the scope of the Jewish Chronicle’s appeal, the choice of Martin Bright as our chief political editor just underlines how out of touch with the real world Stephen Pollard is. It isn’t just a question of Martin’s neo-conservative and Israel baggage – and the circumstances under which he left the News Statesman – but what about the rest of the Jewish Chronicle’s coverage? Take a look at some of our commentators and columnists. The average British reader would take one glance and say “What a rogues gallery!” You have Tzipi Livni, that broken record Melanie Phillips and, worse of all, Geoffrey Aldeman. For God’ sake, Geoffrey Alderman is one of our regular columnist, believe it or not! For a newspaper that’s struggling to keep its readers, the choice of Geoffrey Alderman is a damn strange one, but that’s Stephen Pollard for you. Alderman believes that Jewish settlements in the occupied Palestinian territories are legal, even though they are universally acknowledged as illegal under international law. Moreover, in an article published in the Jewish Chronicle, he said that Islam was founded "in part, on an explicit anti-Jewish discourse". Most controversially, in early 2009 Alderman argued that according to Jewish religious law, it was "entirely legitimate to kill" every Palestinian in Gaza who voted for Hamas. Geoffrey Alderman spits out stuff that not even the British National Party, Combat-18 and the Ku Klux Klan would dare say these days. Just imagine what would have happened if a British Muslim columnist said that it was fine to kill Israelis who voted for a government that slaughters Palestinian civilians. The whole country, from Westminster to the media, from the tabloids to the so-called “quality papers” to the BBC and ITN, would be up in arms with condemnations day and night, day after day for weeks on end. Politicians and others would be calling for prosecutions, Stephen Pollard would be rushing from one TV studio to another bellowing “anti-Semitism”. But here we go, Alderman in effect condoning the murder of innocent civilians and he still writes for the Jewish Chronicle. What a way to appeal to the broader public! What morality! All of our whistleblowers, some of whom are not quoted here but who nevertheless gave us an invaluable insight into the Jewish institutions to which they are affiliated, said that their experience in their institutions had been life-changing, in that it had altered their views of Britain’s Jewish “leaders”, Israel and the Palestinian cause in a most profound way.